The Journey Program is a client-centered plan customized to each unique post-acute agency's needs. QIRT launched this role-based, agency-wide initiative in March to support quality practices at every level of an individual agency's operations. On-boarded agencies included national-sized and mid-sized agencies, but the Journey Program can be tailored to agencies of all shapes and sizes. FLORAL PARK, N.Y. - April 23, 2018 - PRLog -- QIRT launched the Journey Program last month to address post-acute agencies' needs to manage, track, and improve agency-wide processes according to their unique framework. The Journey Program uses quality cycle management (QCM) tools as performance indicators to customize an exclusive path for each agency. Clinician Journey Program: Evaluate, educate, elevate.On the QIRT Advantage Platform, agencies can customize review level per clinician, target education to address weaknesses, and spot-check progress. QIRT badges indicate clinician review level as they journey toward stronger OASIS knowledge, which will lessen the costs per review, saving agencies money and expediting work processes. The ability to track the steps of this journey is unique to QIRT, and the Advantage Platform and every journey is individual to the agency, employee, and clinician. "We've been working with clients to determine what they find most challenging. Asking questions like: 'What does your agency struggle with and how can we make it better?' has resulted in the Journey Program. How can you manage a hundred unique clinicians or how do you track lost claims? QIRT understands that each agency has different needs and each clinician has his or her select journey. QIRT forms the plan for each agency as a whole, and we work as partners to climb the mountain to overall quality," said Laura Page-Greifinger, President and CEO of QIRT. "The journey to quality isn't easy, but it is worth every effort in the long run." 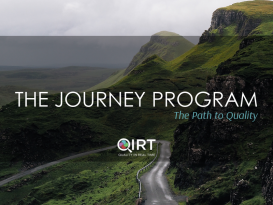 The introduction of QIRT's Journey Program provides clear paths to addressing agency concerns left behind after the launch of the new Conditions of Participation in January and the upcoming QAPI enforcement in June. It also helps agencies to meet regulations and compliance cost-effectively. QIRT leads the post-acute industry in coding, billing, and consulting. Across the United States, QIRT provides agencies with multi-level coding/MDS/UAS reviews, quality assurance, appeals, billing, consulting, and education. Only QIRT's Advantage Platform tracks processes with real-time checkpoints and Quality Cycle Management (QCM) tools along the journey to compliance and success. For more information on the Journey Program, email ContactUs@QIRT.com or call 855.485.QIRT (7478).